Ms. Celiac Says...: Starbucks Discontinues Gluten Free Pastry!!! 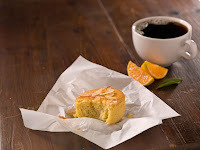 As many of you already know, Starbucks has discontinued their Gluten Free Orange Valencia Cake after introducing it only a little over 2 months ago. The only official comment to come from Starbucks explaining the reasoning behind this heartbreaking decision to the gluten free community is that "it was too much of a treat, and not a nutritious snack. The Kind Snack Bar is replacing it." First of all, I want to state that I love Kind Snack Bars but it in no way can replace a gluten free pastry. Besides, Kind Snack Bars are available everywhere from Duane Reade to Whole Foods and are often found already in most Celiacs' purses or pockets. We are not going to be excited to walk into a Starbucks and grab a fruit and nut bar while everyone else with us is getting a tasty cookie, brownie, cake, etc. In my opinion, Starbucks went wrong with introducing the Orange Valencia Cake as their first gluten free pastry. I feel they should have introduced a more mainstream flavor like a chocolate-based product such as a cookie or brownie or even a delicious banana nut bread or coffee cake. Also, one of these other products may have had more of a chance of appealing to Starbucks customers that are not on a gluten free diet. In fact, a great product for Starbucks to bring back would be the Gluten Free Aztec Ancho Chile Brownie they introduced in April 2007 that was virtually impossible to distinguish from a brownie containing gluten. The discontinuation of the Gluten Free Orange Valencia Cake is definitely a crush to those living with Celiac Disease. However, we must not sit back and accept what has happened. Instead, we need to let Starbucks know that we want gluten free products! I encourage everyone to write to (web form @ www.starbucks.com) or call Starbucks (1-800-235-2883) and let them know your dissatisfaction with them discontinuing their Gluten Free Orange Valencia Cake. Also, Starbucks has a website, MyStarbucksIdea, in which you can voice your opinions. Then other customers can vote up your idea. Ideas with the most amount of votes will get reviewed by Starbucks and may be put into effect. This was how Starbucks came about offering a gluten free pastry to begin with. So, please go to the website and vote-up all of the ideas to bring gluten free options back to Starbucks and when you're there why not write your own comments too?